I want to begin this series by talking about the national parks that I have been to and really enjoyed visiting. Of course, I will also share with you my travel tips. The first national park I visited in the U.S. is Yosemite National Park in California. I visited it again with Alex during our Northern California trip in 2011. Yosemite national park is open 24 hours per day, 365 days per year. I have been there in winter (December) and late spring (end of May). Personally, I would definitely recommend going there in summer or fall, depending on what you want to see. Summer is the best time to go see waterfalls in Yosemite. If you go too early (say, April or early May) you may not be able to visit the Glacier Point due to snow. We were lucky last time and drove all the way up to the glacier point in late May, but on our way up, there was snow everywhere on roadside. Again, it depends on your vacation time, the places you want to visit, whether you want to do a lot of hiking or just driving around…a lot of factors. I would just share with you our itinerary. 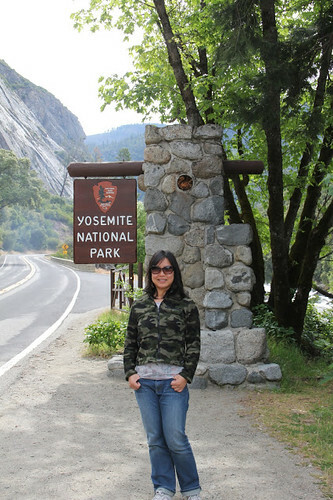 We spent two days in Yosemite: Just enough time for us to try some hiking trails and visiting some scenery spots. For those of you who want to hike the famous Half Dome (14.2-mile), you will need a Half Dome Permits for Day Hikers and you also need a full day. We are not advanced hikers so we tried the first part of the half dome trail, which is the Mist Trail. 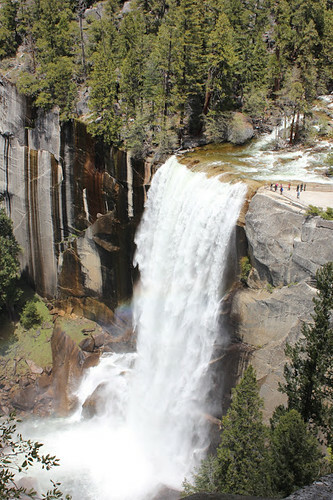 One of Yosemite’s signature trails, the Mist Trail allows you to have a close view of the Vernal fall and Nevada fall. On your way, you will also see Liberty Cap and the back of Half Dome. We chose to come back from the Muir Trail, which gave us a better view of both falls. Do wear water proof clothes ‘cos you will get wet when hiking on this trail. Also, the trail beside Vernal Fall is slippery, so tread carefully. 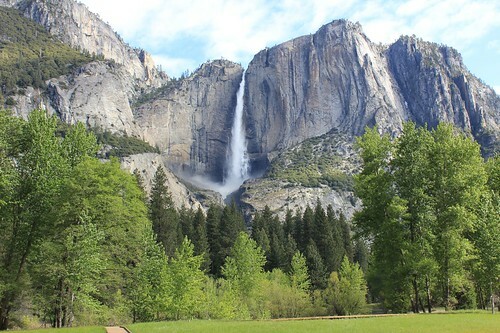 You can actually view the Upper and Lower Yosemite falls from the Yosemite Valley. 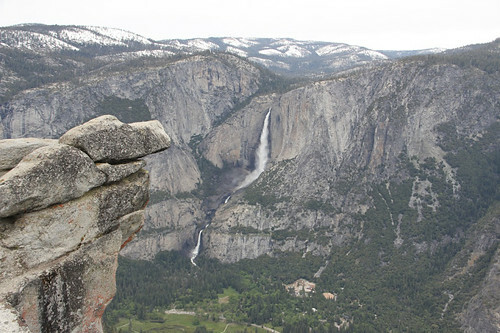 If you are an outdoor fan, you may try the upper Yosemite falls trail, which is 7.6-mile round trip. We just had a close view of the lower Yosemite fall, which is only .5 mile walking. The Yosemite fall is the tallest fall in North America. You can view it from various points in the park, such as the Glacier Point. A close look is quite different, though. Worth trying. From the Yosemite Valley on your way to the Tunnel View or Artist Point, you will pass the Bridalveil fall. If you have time, go for a 1.2-mile hiking. If not, you can stop by the closest parking lot and from there you can see the upper part of the fall clearly. 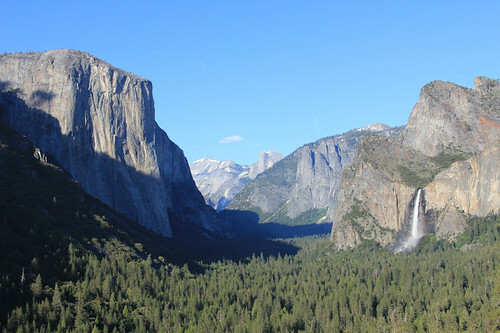 The tunnel View gave you a panorama of Yosemite Park. It’s accessible by car so you can go there before sunset to take really nice pictures. Driving all the way up from the Glacier Point Road, you can visit Glacier Point, another famous scenery point at Yosemite. The Glacier Point road is closed during winter time. When we went there in late May, it was just open for a few days. We still saw snow at roadside. Fabulous place to see Half Dome, Yosemite Falls, and a panoramic view of Yosemite Valley, including the Vernal Fall and Nevada Fall. A must visit place if you go to Yosemite. A lot of people go to Yosemite national park to see waterfalls and half dome. They see those places and then leave. If you have a half day more, I would recommend that you go to the giant sequoias in southern Yosemite. 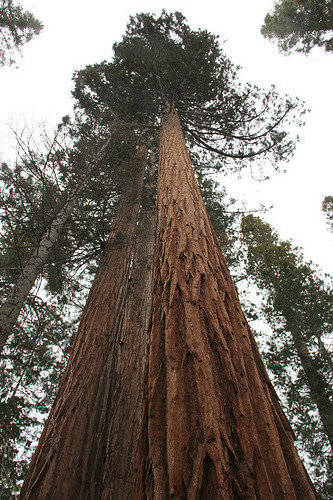 There, you will see a couple dozen mature giant sequoias, including one you can walk through. We stayed in Yosemite Bug Hostel during our visit to Yosemite National Park. They offer different lodging options from private room cabin to tent cabins. We did choose private room cabins and the price was not too bad. We also really liked the food served in their café. It’s still a bit drive (33-mile) to the national park (Yosemite Valley), but not too bad. It's nice reading your beautiful blog. Those photos are amazingly beautiful. It seems like I was there by just looking at them. :) I am glad you enjoy the pictures. I will share more national park pictures in the future posts.